It was a Wednesday night and I was out with Mrs Bar Fly. The Boozy Cow. That was where we were headed, keen to try Edinburgh’s latest burger vendor, which has replaced Amicus Apple on Frederick Street. The first thing you notice is the bright red branding and the cow logo – I began to think The Boozy Cow was what happened when the Laughing Cow had one too many (too cheesy?). However, the Laughing Cow would do well to avoid here or her cheesemaking days would quickly be behind her as there’s no escaping the bloodlust for meat here. I was never in the old Amicus Apple but Mrs Bar Fly had been in before and felt the new place has more of a spacious feel about it. It also has quite a dark feel about it. This isn’t too surprising given its basement setting but this is enhanced by the wide use of dark red, neon and very busy graffiti-style walls. While I’m on the interior, hat tip to the designers who have created the tables towards the front of the bar. Now, me and Mrs Bar Fly are not huge fans of enforced communal dining, but the long tables at the Boozy Cow are ingenious in that they are on a sliding mechanism, allowing them to be separated for smaller groups or put together for larger ones. Genius. No small talk required. This place is based on an establishment of the same name, by the same people, in Aberdeen so the food and drinks have been tried and tested further north. Beer wise, they have taken an interesting approach. It is all 330ml cans and frosted beer glasses. Thankfully, plenty of IPAs were available, including one from Beavertown – one of my favourite breweries whose cans are works of art in their own right. They weren’t cheap though, with all of them costing upwards of £4.00 for something significantly smaller than a pint. There are also lengthy wine and cocktail lists, the latter featuring a fair bit of Irn Bru. In terms of food, they menu is headlined “cows, chicks and dogs”. On this occasion, Mrs Bar Fly went for cow and I went for dog. These arrived on a tray (one between two) and no plates or cutlery are supplied. Instead, rolls of kitchen roll are available on all tables and you’re expected to get stuck in. Stuck in we got and it was pretty good. Ultimately it’s not hard to do decent burgers and hot dogs but it’s amazing how often places fail. These were juicy with plenty topping and a shout out for the spiced skinny fries which were tremendous. Interestingly, we were convinced to try a small piece of their cheese sauce waffles. And yes, they were as bad and as stodgy as they sound, though Mrs Bar Fly was spotted going back in for another couple of mouthfuls. Not for me though. After decent mains, pudding was disappointing. Called a Chocolate Stampede, it was more of a Chocolate Whisper and nothing to write home about. We did feed this back though when it was noticed that we hadn’t finished so hopefully this may become more chocolaty in the near future. We also noticed that there is a Man Versus Food style challenge on the menu here: eat a chilli cheeseburger, a chilli dog, some chilli cheese fries and an Oreo milkshake within 15 minutes and it’s free. Having seen some of the challenges attempted by Adam Richman, this is not massive but I feel the time limit is tight. I’m sure that won’t stop many a young lad giving it a go though. Clearly The Boozy Cow is not for vegetarians. Indeed, not for animal lovers in general given the door to the kitchen is painted to make it seem that a bloodbath is ongoing behind. Further to that, we were told that Boozy Cow staff do their utmost to convince non-meat-eaters of the error of their ways and keep a list of so-called “converts” when they are successful – a list that is steadily growing, apparently. Given that The Boozy Cow is based on a formula that is already working in Aberdeen, this place looks like it will also succeed. It was very busy when we were in, early evening on a Wednesday. The clientele was also a real mix – from students to middle-aged female shoppers, perhaps amused enough by the name to pop in after a hard day in Jenners. This place is very much of now. It’s burgers, it’s slightly different beers, it’s a wee bit controversial and it’s using a “meat” pun on its signage in true Burger Meats Bun style. The Boozy Cow’s variation is “Meat and Drink”. It’s also quirky and has enough to make it stand out from Edinburgh’s many other burger-selling bars to make it worth popping in to next time you’re hungry and in town. 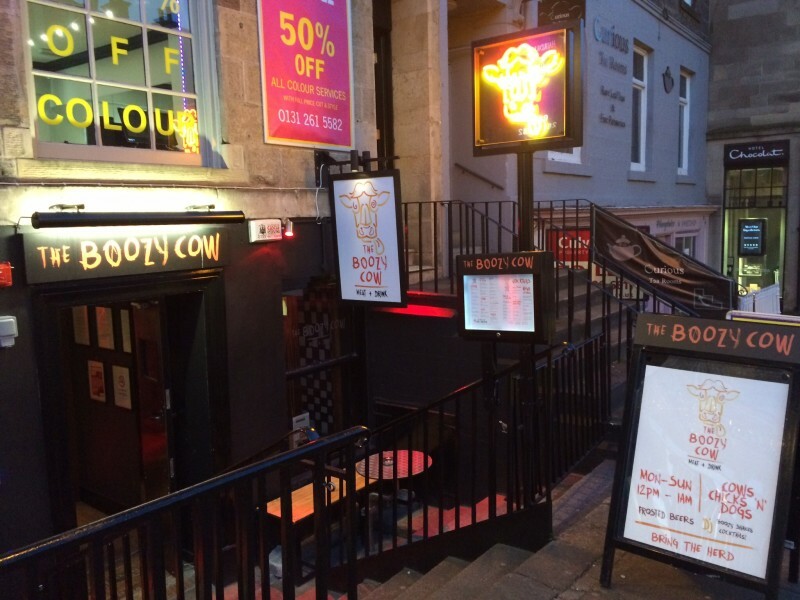 The Boozy Cow is at 17 Frederick Street, Edinburgh, EH2 2EY. Find them on Facebook here and Twitter here.